Happy Mami’s Day to one and all! Ana and I both hope you have a wondrous day – whatever you end up doing. ¡Felicidades! Over at my house, we’re praying the weather cooperates so we can take a trip to the Rocky Mountains, but before I leave, here’s our weekly roundup… Enjoy! 1) 5 Amazing Ways Music Can Teach Your Child a Foreign Language – A really wonderful (and easy) way to introduce a second language to your child is through music. Little kids absolutely love music and kids six and under tend to learn languages faster and easier than adults, especially if given the chance to do so in a fun and stress-free environment. Another great reason to love M-U-S-I-C-A!! 2) Los Bebés Pueden Distinguir un Tercer Idioma – Los bebés que viven en hogares bilingües pueden distinguir dos y hasta tres idiomas, es una de las conclusiones de las investigaciones del equipo de psicología de la Universitat de Barcelona, liderado por la psicóloga Núria Sebastián. Even though this is in Spanish, we thought we’d share it with you in case you – like me – are interested in introducing a third language. 3) All in the Familia – A clan of Miami musicians come together to celebrate three generations of mothers with a Cuban-themed party. Read this, even if it’s only for the recipes, they look yummy! 4) Michelle Obama’s Favorite Food? Mexican – Tortillas, moles, rice and beans, tamales and quesadillas — yes, Michelle Obama loves Mexican food of all kinds, she told some D.C. school children recently. Who would’ve thought it? 6) Reflexión para el Día de la Madre – One of my favorite people in the world – my dear cousin who is only 9 months older than I am and whom I miss dearly (she lives in Perú) – sent me this and I though it was so sweet, I wanted to share it with you. 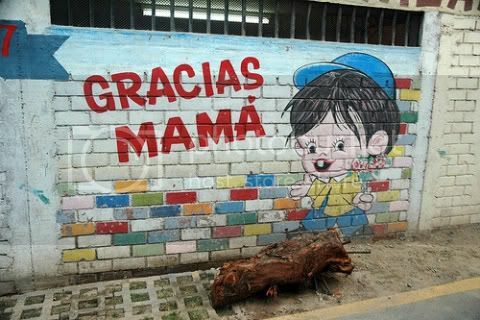 Ah… y gracias, mamá for everything you’ve done and continue to do for me (y mi familia), and for the awesome and unique woman you are! Our Mother’s Day Gift to You: A Giveaway by Victoria’s Secret! Happy Mother’s day! I love Mexican food too. When I was in Mexico I was vegan, if you can believe it! Now, I’m not, so I keep on telling my husband we have to go back Just for the food!